The University of Cincinnati Libraries is not only a center of discovery and education, but it also offers a unique window into the past. Special collections connect students, faculty and staff to historical and literary subjects in meaningful ways while also attracting top researchers and scholars with access to rare materials and resources. On Thursday, March 14, the University of Cincinnati Libraries will host its first fundraiser. 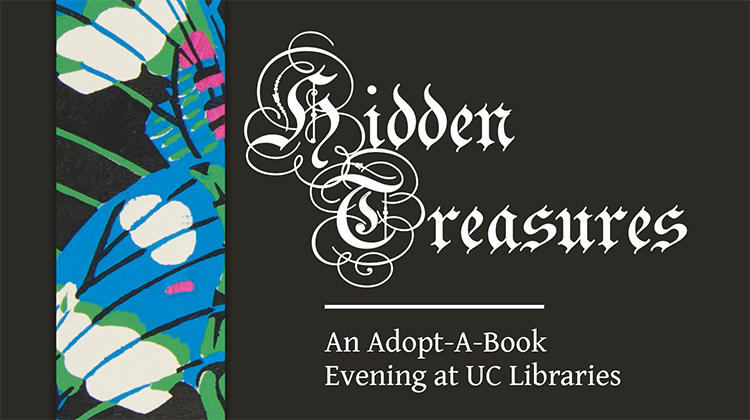 Hidden Treasures: An Adopt-A-Book Evening will offer an in-depth look at some of the Libraries’ most precious materials. Hidden Treasures provides essential funding to support the preservation, acquisition and digitization of books, manuscripts and collections held by the region’s top-ranked research library. Generous private giving allows UC Libraries to grow its collection, to preserve items for future generations and to make materials available to curious minds for exploration and new discoveries. To purchase tickets or for more information, visit foundation.uc.edu/HiddenTreasures. If you are unable to attend, please consider a donation to UC Libraries at foundation.uc.edu/LibrariesAnnualFund.